I am the author of all rims and damask piping. The Mothers manage to cram all manner of musical genius into the ritze und schlitze (cracks and slots) of One Size Fits All. 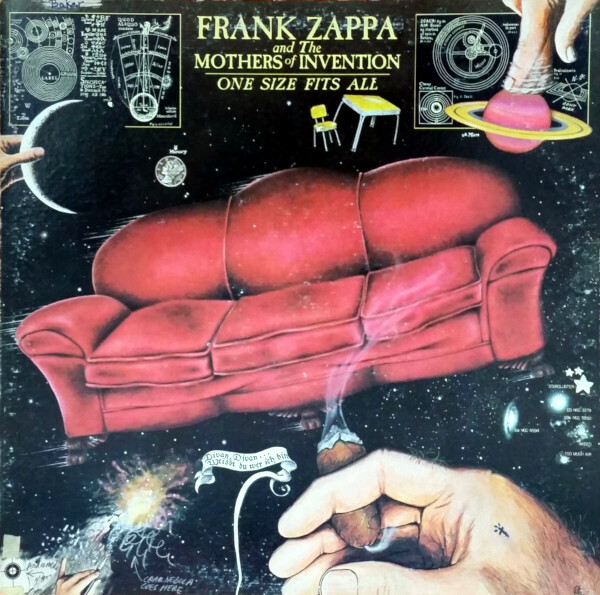 This might be my favorite Zappa/Mothers album of all time. You, in your chrome dinette world with your polished opinions, may believe that Frank Zappa is not one of the pre-eminent musical geniuses of the twentieth century, but you can’t listen to “Inca Roads,” “Florentine Pogen” and “Sofa No. 2” and still seriously believe that. What most impresses me about this album is the fact that I’m still impressed by it, even after The Grand Wazoo, Hot Rats, Over-Nite Sensation, Roxy & Elsewhere. I didn’t expect to encounter any more surprises. Then I heard “Inca Roads” and it was like hearing Frank Zappa with fresh ears: the intricacy, the dexterity, the sheer insanity of it all. After listening to a song like that, anyone would need a break. Enter “Can’t Afford No Shoes,” which prefigures the streamlined approach of Zoot Allures. “Sofa No. 1” returns to Zappa’s quasi-classical haunts, followed by the remarkably tight (and deceptively wise) “Po-Jama People.” Side two opens with another stunner, “Florentine Pogen,” which showcases Zappa’s lyrical and musical mastery to perfection. “Evelyn” is an absurd diversion (Zappa would return to the idea for the opening of “Muffin Man” on Bongo Fury), followed by an invitation for Johnny “Guitar” Watson to sing along on “San Ber’dino” and “Andy,” two of the album’s relatively “normal” rock songs. The record closes, how else?, with Frank declaring Teutonic love for his sofa. It’s an absurdly brilliant record and a wonderful last testament to the last (and best) lineup of The Mothers. Frank Zappa (guitar, vocals), Napoleon Murphy Brock (vocals, flute, saxophone), George Duke (keyboards, synthesizer, vocals), Tom Fowler (bass), Chester Thompson (drums, sound effects, voices), Ruth Underwood (marimba, vibraphone, percussion) with Bloodshot Rollin’ Red (Captain Beefheart) (harmonica on B3), Johnny “Guitar” Watson (vocals on B3/B4), James “Bird Legs” Youman (bass on A2). Produced by Frank Zappa; engineered by Michael Braunstein, Kerry McNabb, Gary O., Bob Stone; mixed by Kerry McNabb. Released on elpee on June 25, 1975 on elpee and cassette in the US and Australia (DiscReet, DS/DIS M5D 2216), the UK (DiscReet, K 59207), Germany (DiscReet, DIS 59 207) and Japan (Warner Bros./DiscReet, P-10045D) with gatefold cover; reached #26 on the US charts. Re-issued on compact disc in 1988 in the US and Japan (Rykodisc, RCD 10095) and France (Zappa, CD ZAP 11). Re-released on remastered compact disc and cassette in 1995 in the US and Canada (Rykodisc, RCD/RAC 10521). Re-released on 20-bit remastered gold compact disc in 1995 in the US, the UK and Canada (Rykodisc, RCD 80521). Re-issued on limited edition (2,000 copies) remastered compact disc on October 24, 2001 in Japan (Rykodisc/Videoarts, VACK-1220). Re-released on 180g vinyl elpee in 2015 in the US (Universal).